The thick, double coat of hair insulates them against the cold and eliminates the need for the heavy layer of back fat common to most cattle breeds. This means that Highlands marble naturally on grass and forage while producing lean, low fat, high quality cuts of beef. 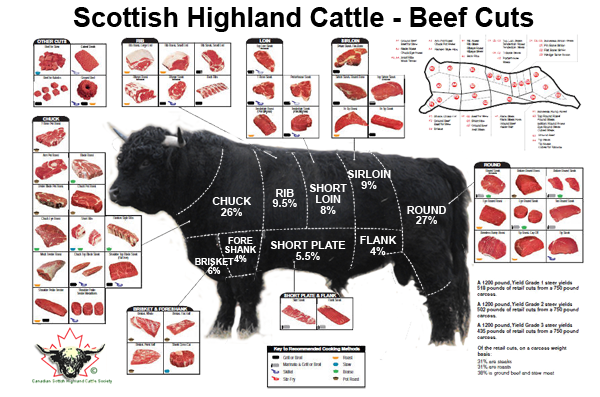 Highland beef has 40% less fat and 70% less cholesterol than standard breeds of beef. It's also higher in protein content, iron and Omega 3's than standard breeds of cattle, making it one of the healthiest meats on the market. There are many nutrients in grass finished beef that not found in corn fed beef. The differences in nutrient density are striking and grass finished beef should not be considered to be equal in quality to corn fed beef. For the consumer eating grass fed & finished beef there are many health benefits. >Cows are raised naturally, on pasture, with no hormones or antibiotics. 2017 price is $3.50/pound Hanging Weight which includes butcher fees. State certified. Processing done at Superior Meats, LLC. Call now to reserve your meat for 2018!